Word reached the apostles that the people of Samaria were being taught, believed and obeyed the gospel. 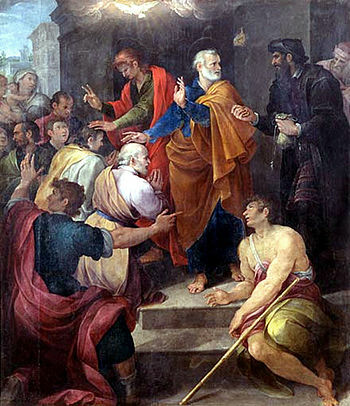 So they sent Peter and John to “lay hands” upon many of them so that they would receive the gifts from the Holy Spirit that would allow them to work the same miracles that Philip was doing – healing the sick, the lame, etc. But it seems clear to this writer that Peter meant exactly what he said. Simon did have bitterness in his heart because of the loss of the attention that he had received from amazing the people, and he wanted that attention back. This selfishness was the motive for his desire to receive the Holy Spirit. There was nothing about it that remotely resembled a desire to serve the Lord or to help others in need. It was pure selfishness and pride that motivated him, and he needed to repent for it. His request for their prayers aft the rebuke gives us hope that he did repent, and perhaps he became useful in the Lord’s church.